I have just bought a 430 and am still waiting for my first sail. Just wondering about the need for a third reef. The North Sails which came with the boat have two reefing lines, and I am just wondering whether it would be worthwhile to make provision for a third reef whilst the sails are in the loft being overhauled. Any thoughts or observations welcome. If your planning on taking the boat offshore, absolutely. Im putting a reef in at 35% of the luff length, which is more a storm reef. For Coastal cruising purposes though, Ive never found it necessary for a 3rd reef. We have had a third reef fitted at 40% of the luff, and that have been used many times. 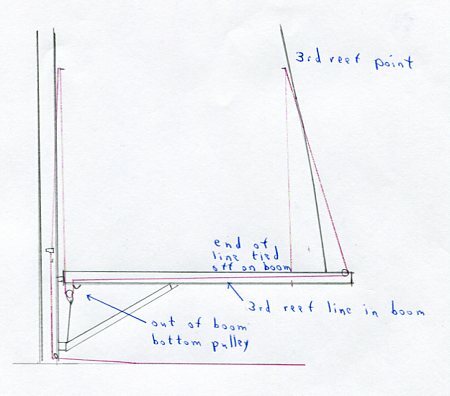 There are two reefing lines for the 3rd reef which go to extra cleats on the port side piano. On the sail we are using low frictions rings instead of blocks. 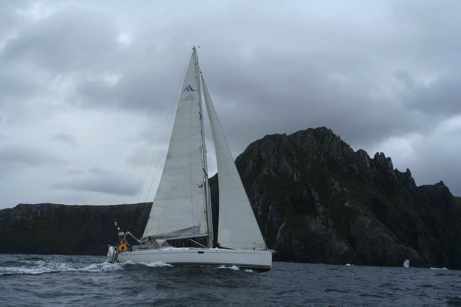 We also have a trysail track fitted alongside of the main track, with a 13m2 sail. More details if you need. I am planning to sail through Chanel and Biscaya next year, so I just ordered a sailmaker to make a third Reef, too. I still don‘t know how to pull it down then. How did you build lines for this? Are you taking reef 1 line off and use it for reef 3? My Hanse 385 only has 2 lines and space for Reef1 and 2. Especially when it’s blowing F9 I want to avoid to walk up to the front but am afraid I will have no choice. Hi, Im still working this out myself. My main is with the sailmaker right now having the reef put in. I do know that im not going to have a permanent reefing line running all the way up to the 3rd reef. Thats too much rope blowing around up there for the little use it will have. There are a number of different ways to do this but im yet to decide on the best method. Stay in touch on this one. The search function in myhanse.com can unveil a lot of secrets, among those a method to route the third reef. Just remember to search for more than six months, which is the standard setup. One option would be to fit the reef line to the first reef to the luff with a pulley with a snap shackle. Then when you go to second reef if you think that the wind may be rising drop the sail for a few minutes ( sail on the jib &/or engine) & move the first reef lines up to the third reef point. It means re roving the line through the leech but you will be doing that before the wind gets too high & all you do at the mast is quickly changing the position of the luff block from first to third reef position. It would not take long & if the wind dropped rather than rose it would be easy to re arrange back to the proper position in the lighter wind. Do not forget to get the sail cover altered for the third reef at the same time as the sail!!!!! This year has been a light wind year, so I must say we have hardly used the third reef system described above, though it has always been nice to know it is there in reserve. In fact, as my wife, who does not really like heavy weather sailing, is also the yacht’s meteorologist, she considers she has failed in her forecasting skills if we have to use it, but since we sail in Scotland anything goes. Based on an earlier thread on the forum, I think I use a similar reefing strategy to many other people. 1st reef main, 2nd reef main, 3rd reef main. Only once we have got to that point do we think about doing anything with the jib. Since this only happens around 30 kts of wind, it means the oft repeated criticism of self tacking jibs is that “you cannot reef them and maintain a good sail shape” is fairly academic in practice. So, I basically use the same strategy as above. 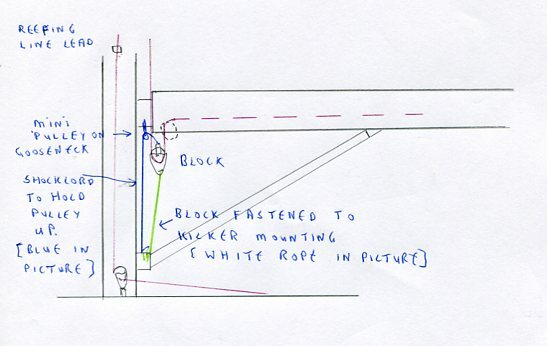 In strong winds and with the wind forward of the beam, I have made good progress with just the self-tacking jib. I will normally use 2 sails as long as possible, so if there is a slight increase in wind, I will just furl the jib. Our yacht is certainly quite happy broad reaching with or without a jib, with either a full or reefed main. A key thing to remember is that with full length battens and swept back spreaders, you need to round up and bring the wind forward of the beam if you want to easily reef the main. So as always, the advice is reef early and if you think you may need a third reef, make certain it is set up before the wind picks up. If you are really expecting a blow, you can consider dropping the main and just sailing under the self-tacking jib, as once the wind is around 20kts, you will have good boat speed.